The beauty pageant industry isn’t all sparkles and glitter as you may think. Last year saw the official Facebook page of Miss World – Malaysia receiving a number of angry comments from netizens. 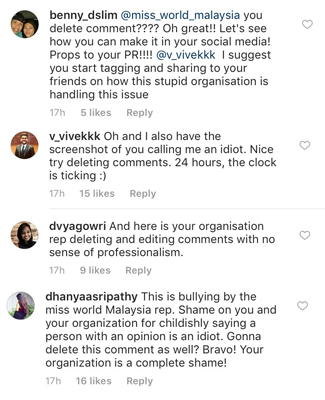 They were mainly dissatisfied by the treatment that Tatiana Kumar (Miss Malaysia World 2016) was receiving (or rather the lack of treatment at all). 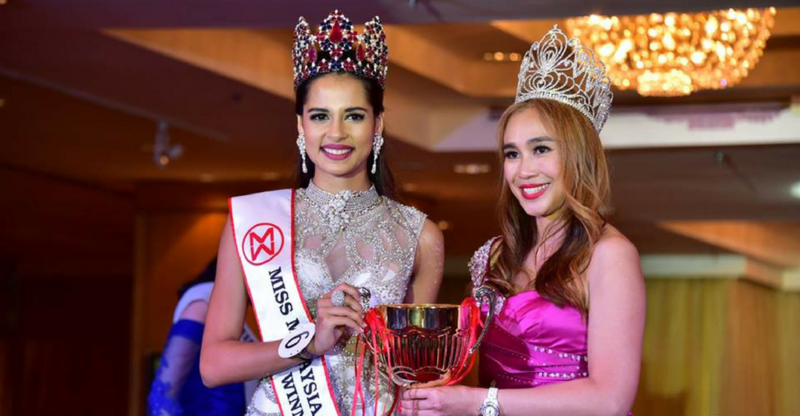 This in return spurred a series of back and forth accusations to be tossed between Tatiana and the Miss World Malaysia organisation, including her father who made some bold claims. However, the drama fizzled out and Tatiana was still in the United States to participate in the Miss World pageant. It wasn’t until yesterday when a new twist to the tale appeared. The post uploaded on the official Instagram page. 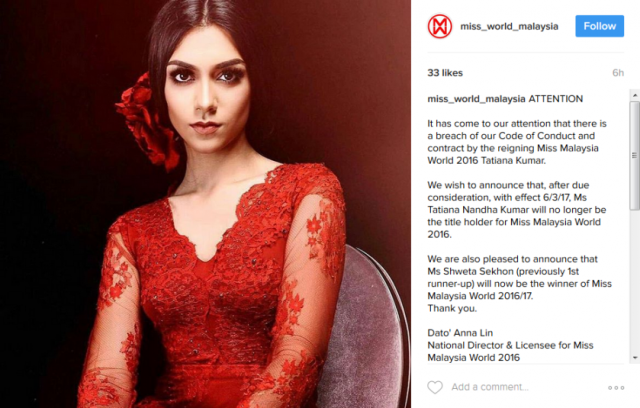 On 7th March, the official Instagram account of Miss World Malaysia announced the decision to strip Tatiana of her title as Miss Malaysia World 2016. They announced the previous 1st runner-up Shweta Sekhon as the new title holder. This post was signed off by the National Director & Licensee for Miss Malaysia World 2016, Dato’ Anna Lin. The post also states that this decision was based on the fact that there was a breach in the contract by Tatiana as there were claims of her making “offensive” comments online. 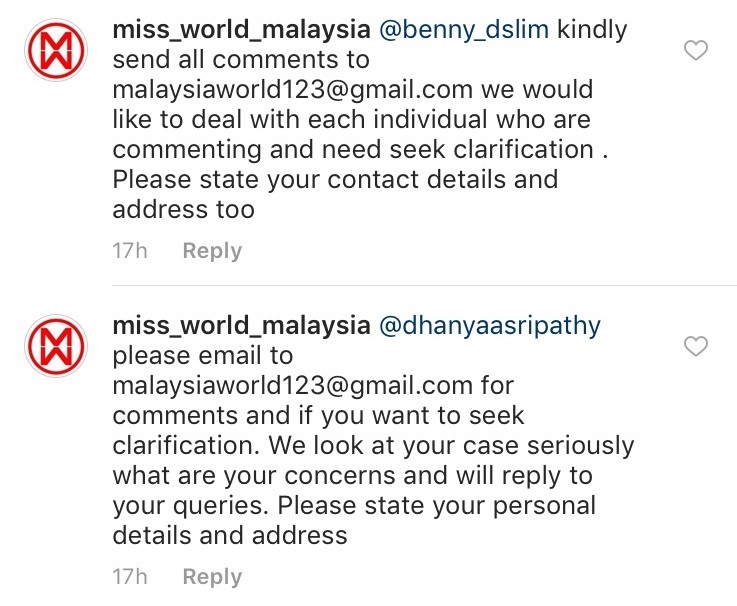 According to Dato’ Anna, Tatiana and her family had made several offensive posts on both the Internet and social media regarding the Miss Malaysia World organisation. “There are certain formalities, and she has also breached one involving an important sponsor. This has led to the contract being terminated,” said Lin to The Star. This has led to a flurry of comments to be left on the account with many of the responses expressing their disapproval on this abrupt decision since Tatiana had just returned from representing our country on the final stage of the Miss World pageant. We managed to contact Tatiana for her side of the story where she shared a part of her official statement. She clarified that she had received a letter from Dato Anna Lin’s company on the 3rd of March alleging that there was a breach on the agreement formed between her and the company. 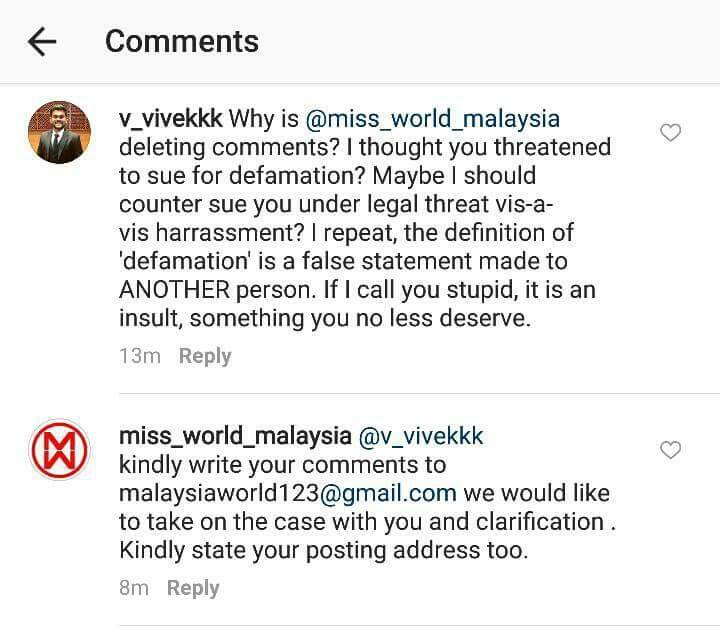 The lawyers claimed that as a consequence of such alleged breaches, the agreement with her company has been terminated and her title as Miss World Malaysia 2016 has been removed. “The termination of the Agreement and the removal of my title are wrongful and wholly unjustified, as I have certainly not breached the Agreement or any so-called Code of Conduct. More importantly, the allegations made against me are wholly false and unacceptable. 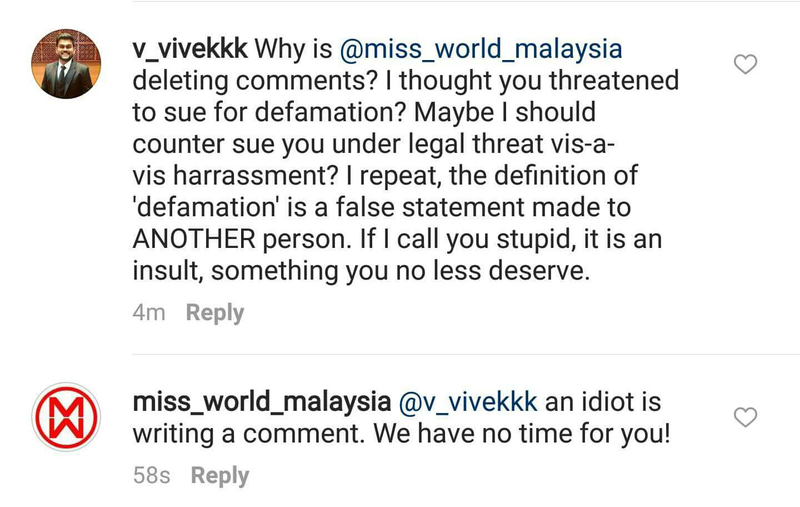 I am very upset and disappointed with these allegations as I have conducted myself with utmost professionalism as Miss Malaysia World 2016 to-date,” said Tatiana in her official statement. It’s never a pretty picture when these incidents happen, especially when you’re on the receiving end of netizens’ wrath. But there are ways for companies to handle these cases and remain professional while still defending themselves. We’re no social media experts, but here’s some things that corporations can consider doing should a PR disaster come their way. It seems to be a rookie mistake companies do when a PR issue arises. Whenever things start going crazy on social media, the worst thing a PR representative could do is defend by deleting comments. As of the time of writing, we weren’t able to find any comments with negative remarks but a user, Vivek on Instagram shared screenshots of a comment left by the account that had been deleted. Afterwards, the comment responding to Vivek’s post was replaced with a new reply. This prompted others to question the account on their reasons behind deleting comments and how unprofessional it seemed to the public eye. Users stating that the official page had been deleting comments. The account simply responded with a generic reply afterwards. Examples of their responses to comments. This can be seen as a bad move as it only provides ammunition for people to use and fire back. People can also take the act of deleting comments as a sign of guilt and an attempt to cover up what has been done. Remember, we live in a day and age where your traces left online can never be truly deleted. Refrain from using words that could backfire. In these situations, it’s dangerous to use strong words that could maybe be used against you. 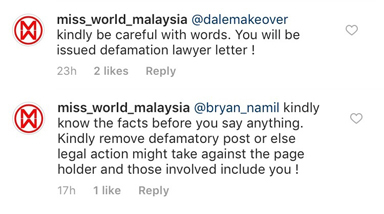 The organisation was seen using the term “defamation” when no such act was being done by the users responding to their post. This was what Vivek had been trying to comment on before the organisation responded with derogatory slurs. “Defamation means suing a person who made a false statement about you to someone else. If you make it to the person directly yourself, that is either an insult or a complaint,” he said, explaining the contents of his original post, that has now been deleted. “As a public organisation that may represent a role model for many young Malaysians, the organisation should have known better than to threaten the public with frivolous law suits that have no legal basis,” said Vivek to Vulcan Post. Companies may have forgotten that social media is a key tool but there comes a big responsibility with it too. Official accounts should constantly maintain a professional tone when responding. It is never right to use degrading or negative terms when replying to comments as that will further infuriate the public. It doesn’t help their case if that’s the front that they’ve presented, and it turns the tide of public opinion against them.